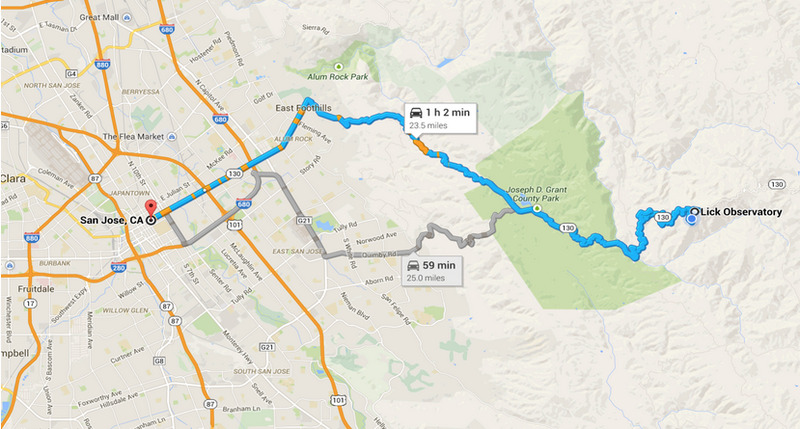 Map from San Jose to Lick Observatory, courtesy of Google Maps. Allow about one hour from San Jose, and please drive carefully as the road is scenic, but winding. Lick Observatory is located on the summit of Mt. Hamilton in the Diablo Range east of San Jose. To get there from Interstates 101, 280, or 680, take the Alum Rock Avenue exit and head east. Turn right on Mount Hamilton Road (CA route 130) and drive 18.5 miles to the Observatory. From the east, take Interstate 580 west to Interstate 680 south. Then follow the directions above. Alternatively, you may take take California Route 130 to Mt. Hamilton from the east, but please allow about 1-3/4 hours from Interstate 5 to reach the Observatory. The road is long and winding, but well-maintained. Take the Patterson exit off Interstate 5, and go west on Puerto del Canyon Road (away from Patterson.) At the Junction Cafe, turn left to stay on California Route 130. All parking at the observatory is free. Parking spaces are available outside of the main building, and down the hill across from the school. Special parking arrangements must be made for car, bike, and motorcycle clubs. If you are planning on visiting the observatory with a group, please contact us at giftshop@ucolick.org to make advanced arrangements for access. We recommend that groups of 10 people use a small shuttle bus for transport up to Mt. Hamilton. Large buses are not recommended on Quimby Road and Mt. Hamilton Road or San Antonio Valley Road, as it is very difficult to navigate some of the tight turns. If you're planning to visit in a group, please notify us in advance so we can better assist with your visit. E-mail giftshop@ucolick.org for more information. Be cautious on Mt. Hamilton Road. The drive is scenic, but the road is narrow in some areas and also has many sharp curves. There are no gasoline or automative services at Mt. Hamilton or anywhere along the road outside of San Jose. Food services are limited at the observatory. Light snacks, coffee, and refreshments will be available for purchase. We recommend packing a picnic to enjoy at the observatory. For more information, please contact giftshop@ucolick.org.